It’s no secret—we LOVE all pups, kitties, and creatures furry, feathered, and scaled. 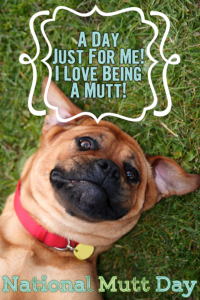 But, July 31st is a day the Mutts in our lives get a little extra shout-out for National Mutt Day! In addition to requesting that you extend extra belly rubs to the Mutts in your lives, we’d also encourage our awesome Pet Parents to discover ways in which you can help and support less fortunate Mutts awaiting their forever homes. Many shelters depend on National Mutt Day for spreading awareness, receiving donations, gathering an increase in volunteer applications, etc. How will you love a little harder this National Mutt Day? ImPURRRRtant reminder to any friends and family considering adoption—OUG! offers our Home-U-Go! 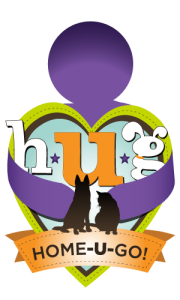 aka HUG Program as a pay-it-forward to support, sponsor, and donate to our local shelters. 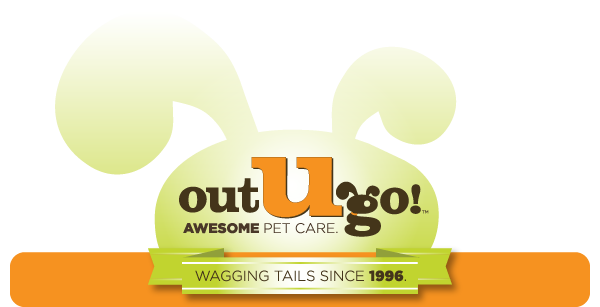 – Your BFFs at Out-U-Go! 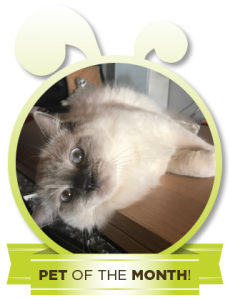 This entry was posted in Voice of the Top Top Dog and tagged adoption, animal shelter, National Mutt Day on July 27, 2017 by Allie. 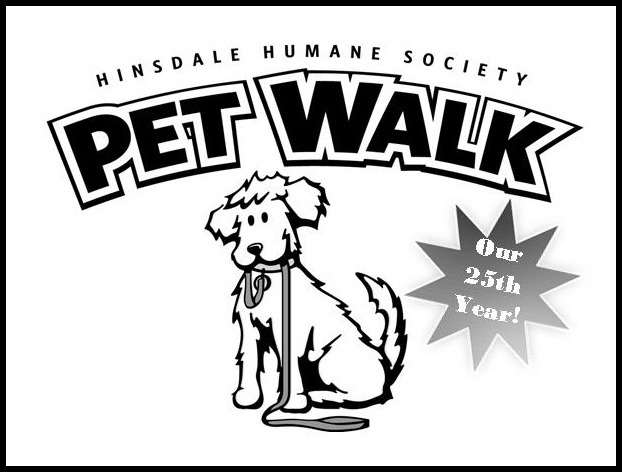 We are looking forward to our third year of participating in the Hinsdale Humane Society Pet Walk fundraiser! The pet walk is all set for Sunday, June 1st starting at 9am at Katherine Legge Park in Hinsdale. We hope to see you there! 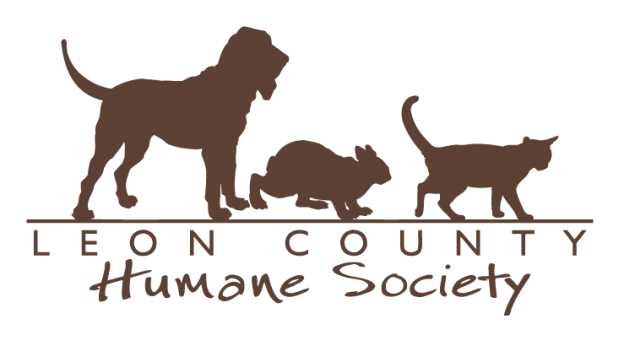 For more information, to register, or to donate, visit Hinsdale Humane Society. This entry was posted in Downers Grove Diary and tagged animal shelter, Downers Grove, fundraiser, Hinsdale Humane Society, Katherine Legge Memorial Park, outdoor events, pet events on May 27, 2014 by Laura Rumage. We’re so proud of our pet sitter, Liz, and her Puppy Bowl sports superstars! When Liz is not working for us part-time evenings and weekends in Oak Park, she’s running Chicago’s ROMP Italian Greyhound Rescue. 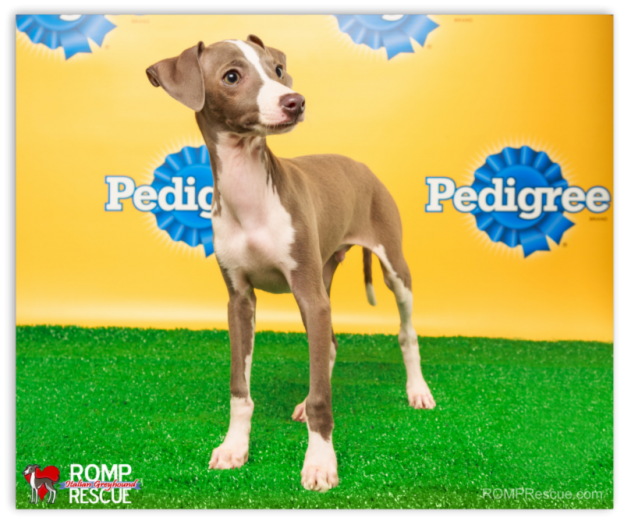 This year, ROMP became the first Chicago rescue ever selected to participate in Animal Planet’s popular Puppy Bowl X show! Tail wags to contenders Sharpie & Taser for a game well-played! Check out their friends still looking for forever homes at ROMP Rescue. 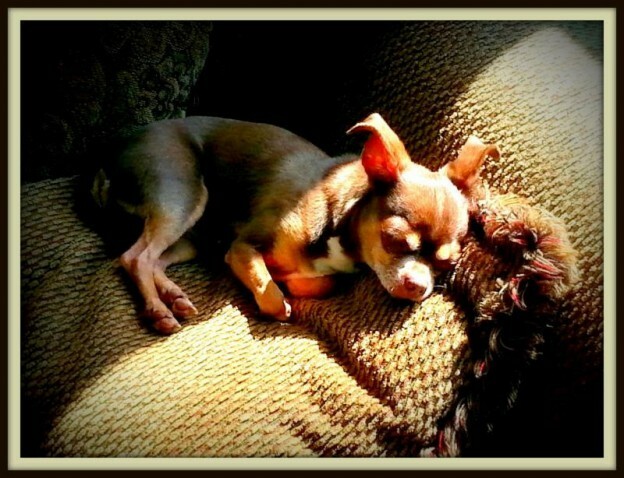 This entry was posted in Chicago Catch, Oak Park Pupdate and tagged animal shelter, Chicago, Italian Greyhound, pop culture, rescue, ROMP Rescue on March 15, 2014 by Laura Rumage. Denver & Boulder’s Hands for Paws Donation Drive To Benefit Maxfund No-Kill Shelter! The Out-U-Go! 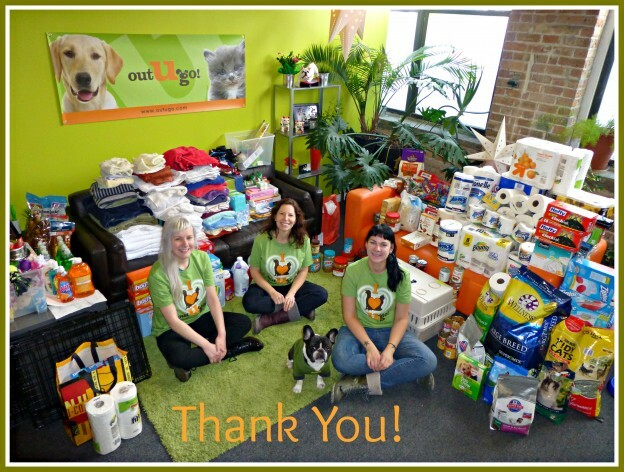 Hands for Paws donation drive benefiting the Maxfund No-Kill Shelter in Denver was a huge success this year! 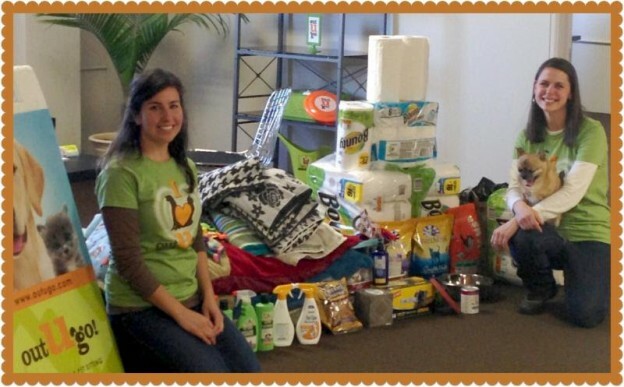 Once again, our awesome pet parents donated a ton of supplies that the Maxfund really needed. 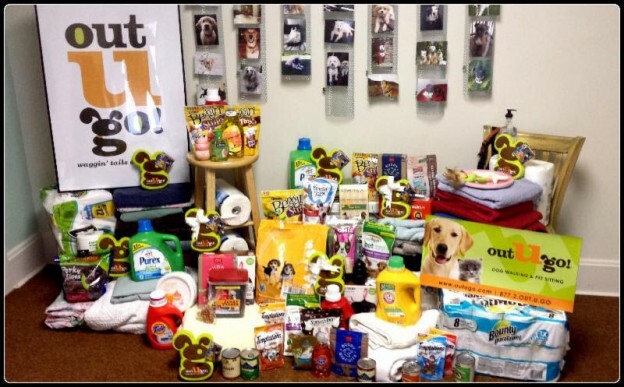 Last month, we dropped off a truckload of the supplies our pet sitters picked up from your homes (leashes, dog beds, food & treats, paper towels, cleaning supplies, and more) to the Maxfund. They were so grateful to receive your gifts! THANK U to everyone who helped make it happen! 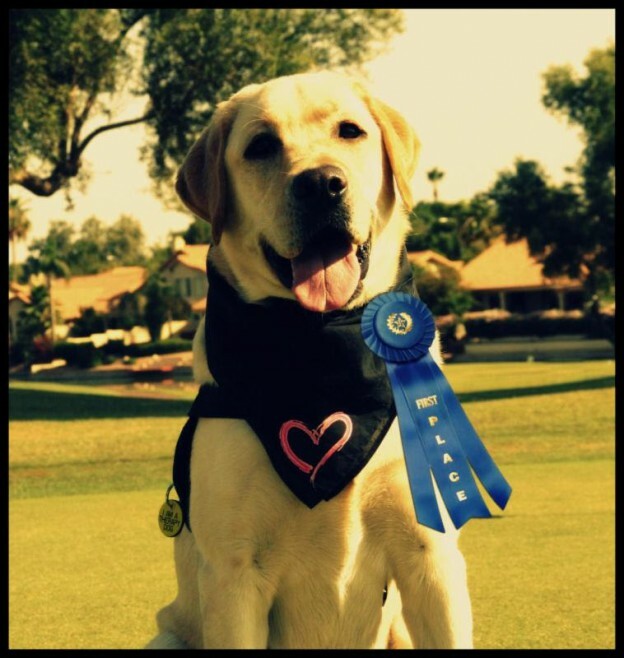 This entry was posted in Boulder Beat, Denver Dogs and tagged animal shelter, boulder, charity, colorado, denver, fundraiser, Maxfund No-Kill Shelter on February 13, 2014 by Laura Rumage. Bones, toys, treats, garbage bags, towels, batteries, postage stamps, office paper and money! This entry was posted in Downers Grove Diary and tagged animal shelter, charity, Downers Grove, fundraiser, Hinsdale Humane Society, homeless dogs, shelter, West Suburban Humane Society on January 24, 2014 by Laura Rumage. We are overwhelmed and grateful beyond belief for the participation we received this year for our 4th annual Out-U-Go! “Hands for Paws” Holiday Donation Drive! 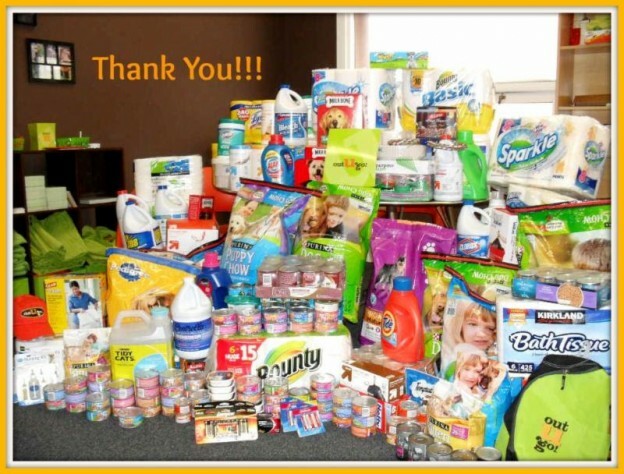 We will now have the honor of delivering all of these amazing donations to the very deserving pups and kitties at the Naperville Area Humane Society. We have the most generous pet parents around and cannot thank you enough for making this a huge success! This entry was posted in Naperville News and tagged animal shelter, charity, fundraiser, homeless dogs, naperville, Naperville Area Humane Society, shelter on January 23, 2014 by Laura Rumage.